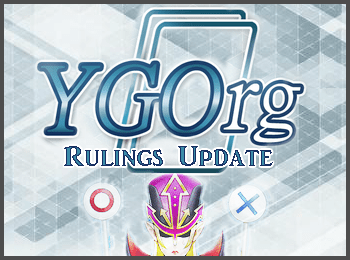 While the TCG tries to figure out if Deneb activates, you can enjoy the pristine clarity and consistency of OCG rulings. This week brings more Extra Pack 2017 rulings. Q: Macro Cosmos is face-up in my opponent’s Spell & Trap Zone. In this situation, if I Link Summon a Subterror Behemoth Fiendess using Subterror Behemoth Ultramafus and Subterror Behemoth Phospheroglacier, does Subterror Behemoth Fiendess gain ATK from its effect? Q: Macro Cosmos is face-up in my opponent’s Spell & Trap Zone. In this situation, if I activate the effect of Subterror Behemoth Fiendess that sends a Flip monster from my Deck to the Graveyard and Special Summons a monster from my hand in face-down Defense Position, what happens? A: In this scenario, the Flip monster chosen from your Deck will be banished due to the effect of Macro Cosmos, instead of sent to the Graveyard. In that case, you cannot Special Summon a monster from your hand. Q: When resolving the effect of Subterror Behemoth Fiendess that Special Summons a monster from my hand in face-down Defense Position, do I have to show that monster to my opponent? A: The effect of Subterror Behemoth Fiendess allows you to Special Summon any monster from your hand in face-down Defense Position. It is not an effect that Special Summons monsters with a certain name, etc., so you do not have to show your opponent. Q: My opponent activates Acid Trap Hole, targeting my face-down Defense Position Subterror Behemoth Umastryx. After Subterror Behemoth Umastryx is flipped face-up, since it has more than 2000 DEF, it is changed to face-down Defense Position again. At this time, can I activate the effect of a Subterror Nemesis Warrior in my Graveyard that Special Summons it? A: In this scenario, the Subterror Behemoth Umastryx targeted with Acid Trap Hole is in face-down Defense Position after the effect resolves, but since it was flipped face-up once, you can activate the effect of Subterror Nemesis Warrior in your Graveyard. Q: A Defense Position Subterror Nemesis Defender is face-up on my field, while a face-down Defense Position Subterror Fiendess and Subterror Behemoth Dragossuary are also on my field. In this situation, when my opponent targets my face-down Subterror Fiendess for an attack, but I activate the effect of Subterror Nemesis Defender by sending it to the Graveyard, will a replay occur? A: When a face-down Defense Position monster on your field is attacked, and the effect of Subterror Nemesis Defender is used, the monster it targets becomes the new attack target. Even though the number of monsters on your field changed as a result of sending Subterror Nemesis Defender to the Graveyard when activating its effect, a replay will not occur. Q: Subterror Behemoth Voltelluric and Subterror Behemoth Stygokraken are face-up on my field. In this situation, if Book of Eclipse is activated and both of those monsters are changed to face-down Defense Position, can I activate the effects of both Subterror Behemoth Speleogeist and Subterror Behemoth Stalagmo in my hand? A: In this scenario, even if multiple monsters on your field were flipped face-down at the same time, the effects of Subterror Behemoth Speleogeist and Subterror Behemoth Stalagmo that Special Summon them cannot both be activated. In this case, you may Special Summon Subterror Behemoth Stalagmo (for example) after Book of Eclipse resolves, then activate its effect that changes it to face-down Defense Position during your Main Phase, afterward Special Summon Subterror Behemoth Speleogeist from your hand, and so on. Q: I activated the “FLIP:” effect of Subterror Behemoth Voltelluric and took control of my opponent’s face-down Defense Position Subterror Behemoth Ultramafus. If I Flip Summon that Subterror Behemoth Ultramafus, then activate its Ignition Effect that changes it to face-down Defense Position again, what happens? A: In this scenario, even if a monster you took control of with the effect of Subterror Behemoth Ultramafus is flipped face-up and/or flipped face-down, the effect continues to be applied normally. Therefore, control of Subterror Behemoth Ultramafus still returns to your opponent during your next End Phase. Q: When I activate the “FLIP:” effect of Subterror Behemoth Speleogeist, I target a face-down Defense Position monster on my opponent’s field. If that monster is Maiden with Eyes of Blue, what happens? A: If a face-down Defense Position monster is targeted with the effect of Subterror Behemoth Speleogeist, that monster is changed to face-up Attack Position normally. In this case, since Maiden with Eyes of Blue has 0 ATK, its ATK is not changed by the effect of Subterror Behemoth Speleogeist. Q: My opponent’s Subterror Nemesis Archer that is affected by Forbidden Lance attacks my face-down Defense Position Subterror Behemoth Stygokraken. At this time, if I activate the effect of The Hidden City, how does it resolve? Q: I Special Summoned a Subterror Behemoth Burrowing as a monster, using the effect of Magical Hats. If that Subterror Behemoth Burrowing is not destroyed by battle, but rather by the effect of Magical Hats at the end of the Battle Phase, can the effect of Subterror Behemoth Burrowing that adds a “Subterror” monster from my Deck to my hand be activated? A: In this scenario, if Subterror Behemoth Burrowing is treated as a monster and destroyed at the end of the Battle Phase by the effect of Magical Hats, you can activate its effect that adds a “Subterror” monster from your Deck to your hand. Q: While the effect of my opponent’s Droll & Lock Bird is applying, can I activate the effect of SPYRAL Double Helix? A: Even if the effect of Droll & Lock Bird is applying, you can activate the effect of SPYRAL Double Helix. If the top card of your opponent’s Deck is of the declared type, you cannot add a “SPYRAL” monster from your Deck to your hand due to the effect of Droll & Lock Bird, so you must add one from your Graveyard to your hand, or Special Summon one to your Zone that SPYRAL Double Helix points to. Q: I activate the effect of SPYRAL Double Helix, and Special Summon a SPYRAL Super Agent from my Deck or Graveyard as a result. At this time, can I activate the effect of SPYRAL Super Agent that destroys a Spell/Trap Card on the field? A: If SPYRAL Super Agent is Special Summoned by the effect of SPYRAL Double Helix, it has been Special Summoned by the effect of a “SPYRAL” monster, so its effect that destroys a Spell/Trap Card on the field can be activated. Q: SPYRAL Super Agent equipped with SPYRAL GEAR – Fully Armed destroys my opponent’s Colossal Fighter by battle and sends it to the Graveyard. When the effect of SPYRAL GEAR – Fully Armed is activated, if my opponent also activates the effect of Colossal Fighter as Chain Link 2 and targets that Colossal Fighter, what happens? Q: When I Special Summon SPYRAL Sleeper, I activate the effect of SPYRAL MISSION – Recapture and take control of my opponent’s face-up SPYRAL Quik-Fix. Afterward, if Book of Moon is activated and SPYRAL Quik-Fix is changed to face-down Defense Position, what happens? A: In this scenario, the SPYRAL Quik-Fix that you took control of is no longer affected by the effect of SPYRAL MISSION – Recapture that prevents it from attacking directly. (If it is flipped face-up during the same turn, it can attack directly normally.) However, the part of the effect that allows you to gain control of it until the End Phase still applies as usual, and SPYRAL Quik-Fix will return to your opponent during the End Phase. Q: If I activate Revendread Origin, and Tribute a Revendread Slayer in my hand, can I Ritual Summon that Revendread Slayer from the Graveyard?